These roasted beets with orange and dill are the perfect side dish to your Christmas dinner. The roasted red beets, sweet & sour pickled fennel and zesty orange honey dressing are a match made in heaven. You cannot go wrong with this lovely dish. Perhaps the best thing about it is that you can prepare it well in advance. 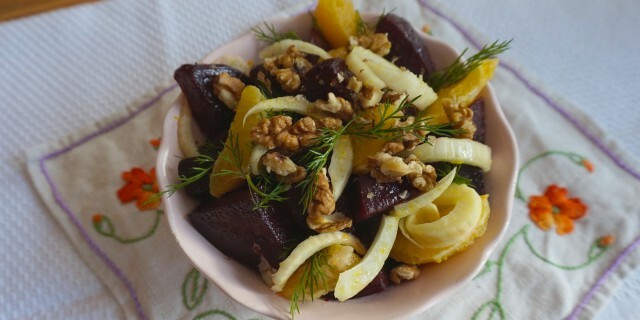 These roasted beets with orange and dill are just perfect for a stress-free & no-fuss holiday! Mix all the dressing ingredients in a small bowl. Cover and set aside. To pickle the fennel, add the sliced fennel to a canning jar. Add orange juice, apple cider vinegar, black peppercorns and honey. Shake well, seal the jar and place in the fridge for at least 1/2 hour. It will keep for up to a week in the refrigerator. Place red beets in a single layer on a lightly greased non-stick baking tray. Drizzle with olive oil and season with salt and pepper. Cover the beets well with alu foil. Roast until tender for about 45 minutes. Allow the beet wedges to cool down slightly. Sprinkle the dressing on the roasted beets. Serve with orange wedges, pickled fennel, walnuts, fresh dill and the fennel tops.